Detergent specially formulated for washing vehicles by hand or automatic car washes. Highly Effective: Quickly removes soil and traffic film. Free rinsing leaving a streak free shining finish. Contains no additives or materials likely to set up corrosion. 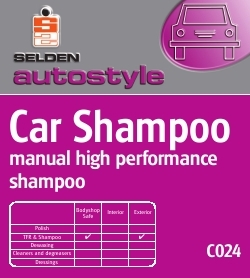 Dilute Car Shampoo 1 part shampoo to 500 parts water. Apply solution generously using a sponge or soft cloth. Rinse vehicle with clean water and allow to dry. For a final finish the vehicle may be dried with a chamois leather. N.B. AVOID WASHING VEHICLES WHILE THEY ARE EXPOSED TO HOT SUNSHINE. Composition Aqueous blend of anionic, non ionic and amphoteric surfactants together with dye, viscosity modifiers and preservatives.